Huge explosions have ripped through a munitions depot in Russia’s Samara Region where up to 13 million shells were stored. More than 1,500 firefighters were deployed to combat the blaze, which killed one person and forced thousands to flee. Fires in the surrounding areas have been eliminated, however explosions at the landfill site are continuing. "A fire defense tank has been deployed at the landfill site. Six aircraft are controlling the temperature around the hazardous object. The hardest part is to stop the explosions," Andrey Tretyakov, deputy head of EMERCOM (National Crisis Management Centre of the Ministry for Emergency Situations) in the Volga Region said adding that 237 shells have been found in a settlement near the ammunition depot. Local authorities declared a state of emergency after artillery shells began exploding at an ammunition depot about 15 kilometers from the city of Chapaevsk. The first blast was heard at around 15:00 GMT on Tuesday, with further detonations rocking the area through the night. Firefighters initially had difficulty reaching the blaze, as shell shards were scattering around the area. The depot housed some 13 million shells of various calibers at the time the explosions began. Nearly 6,000 of these rounds were 122-millimeter artillery shells, and the rest were 23- and 30mm anti-aircraft shells, the Emergencies Ministry reported. A self-detonated artillery shell may travel as far as 1.5 kilometers before exploding, the ministry warned, urging civilians to avoid the area. The facility also had a number of 80mm rocket launcher rounds, which are stored in a separate secure depot. One person was confirmed killed in the incident on Wednesday after a body was discovered while rescuers searched through the rubble. The deceased was confirmed to be a man who was in a steam room when the accident happened, and was unable to escape. According to preliminary reports he was a general worker, and is believed to be a 30-year-old citizen of Kazakhstan. Ten people were taken to hospital, while 31 others required on-site medical attention and were released afterwards, the ministry said. Police have cordoned off the area, and ordered at least 6,500 people from a nearby community to evacuate. Rescuers used an armored vehicle to pick up a depot staffer near the epicenter of the fire –well within the area threatened by the exploding ammo. More than 1,500 firefighters and rescuers with 240 vehicles were deployed to fight the blaze. The Emergencies Ministry also dispatched two planes with robot-equipped bomb disposal experts. Russia’s defense ministry has ordered nearly 40 sappers from five mine-clearing groups to be deployed to tackle the fire and explosions. Rescuers monitored the area with reconnaissance drones overnight before ruling that it was safe to send in crews. 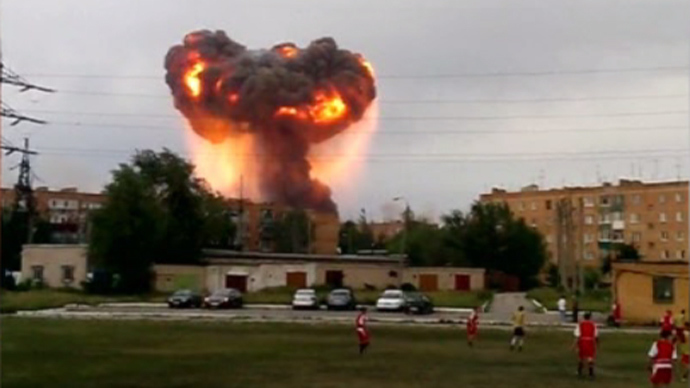 Ammunition depot explosions are not a rare occurrence in the Russian Federation. Over the last three years, more than a dozen incidents have shocked the nation taking the lives of both civilians and military personnel. The tragic highlights include July 2010 in the Altai region where six people died from explosions, including four civilians. In April 2011, an explosion at a military warehouse claimed the lives of four civilians employed by the Defense Ministry. In the Udmurtia region, a blast in June 2011 killed seven soldiers and wounded more than 100 people. Last year alone ten such incidents lit up the skies. The most tragic ones include an explosion in May 2012 in which six people were killed and four were injured. That accident, in the Nizhny Novgorod region, was followed by an explosion two weeks later in the Far East in which two people died. In September, while dismantling pieces of ammunition, an explosion claimed the life of one soldier in the Orenburg region. “Chapaevsk is covered by smoke. The shells are exploding at a military depot in Nagorny community. The federal highway has been blocked,” the city resident @andygoalkeeper posts on Twitter.